Today I want to share an encouragement to all the ladies out there -- and also to all the men out there who have a sister, mother or wife! I’ve seen over my decades of raising a family and building the church that there are a lot of opinions out there about women in leadership, both in secular and church circles. So one day I decided to write a book to officially tackle this topic! I share my personal experiences with this topic, along with truth from the Word, in a captivating book called: Breaking Through The Stained Glass Ceiling. Do you feel called to lead but have felt resistance to that, especially in church? Have you seen a female pastoring a church and wondered if that’s okay or not? Do you feel confused about the subject of women in leadership because everyone seems to have a different opinion on it? Then I highly encourage you to check out this book and decide for yourself what you believe based on God’s Word. And men -- this will be eye-opening for you as well and help you support the women in your life who feel called to lead! “Written with humor and sharing from personal experience Beth gives a balanced look into the strength that emerges when men and women are empowered to work together as a team to build the church. Beth’s passion to see generations of women rise up and take their place will encourage you to discover your value, purpose and the amazing gifts you have to offer the world around you.” - Donna Pisani, Co-Lead Pastor, Capital City Church in Washington D.C.
As we near Christmas, where we celebrate the eternity-changing reality that Christ was born on this earth to save us -- let’s keep the main thing the main thing! Jesus’ priority is the Church and regardless of where we live or what our occupation is, we should be passionate about what He’s passionate about! Why is this important to think about right now?...There are many still seeking and still lost who may not be willing to attend Church on a normal weekend but who WILL go to a service at Christmastime. So, what can you do to help your Church prepare for and host those services? We could all make a million excuses about being too busy, saying we’ll help out “someday” -- well I’ve checked the calendar, and there’s no day called “someday” y’all! So, make today your day! If you don’t yet volunteer at your local Church, call them today to ask where they need help. If you already do regularly volunteer at your Church, THANK YOU for being about the Father’s business -- now I’d encourage you to take your help up a notch in this super special Christmas season where many, many lost will come to know Christ as their Lord & Savior! Chris said something in our conversation that I am still thinking about to this day...and so much that I wanted to talk more about it in today’s basic thought podcast! I’ll give you a hint: it has to do with what voice(s) you’re listening to…. In a world full of noise, it’s so important that you know the voice of the Great Shepherd (Jesus, of course), but also that you’re creating space to hear from and esteem the voice of your local shepherd -- your local Pastor! After all, God is super intentional about what local church body He wants you planted in -- and He anoints your Pastor to speak the right topics at the right time in the right way, so that you’re getting the wisdom, insight and direction you need for this abundant life He’s promised us. Where in this day-and-age can you look for and find true satisfaction? Try “Happy Hour!” No, not the Cheers “where everybody knows your name” Happy Hour…I’m talking about Church! Any other version of Happy Hour doesn’t actually fix the issues in life and it doesn’t produce lasting happiness. So today I’m letting you in on a little secret...there is one Happy Hour that actually improves your life, gives you lasting joy and leads to a full, happy life! That’s why I look forward to Happy Hour every weekend -- it’s at Church, people! God is using His Church to take people from a life of sin and depression, hurt and brokenness, rejection and loneliness, dissatisfaction and emptiness -- to life and joy, healing and wholeness, approval and friendship, satisfaction and fulfillment. It’s been said, “God loves us enough to reach us where we’re at, but He loves us too much to let us stay there!” It's true -- and He's using His Church to reach people and redefine Happy Hour! Of course, we shouldn't be surprised -- this has been God’s plan all along, as we can see from Psalm 36:8. So today, I encourage you to get connected to His House -- a thriving, growing, loving local church -- and plug into Happy Hour every weekend! New Podcast: Elevation Worship -- In The House!! 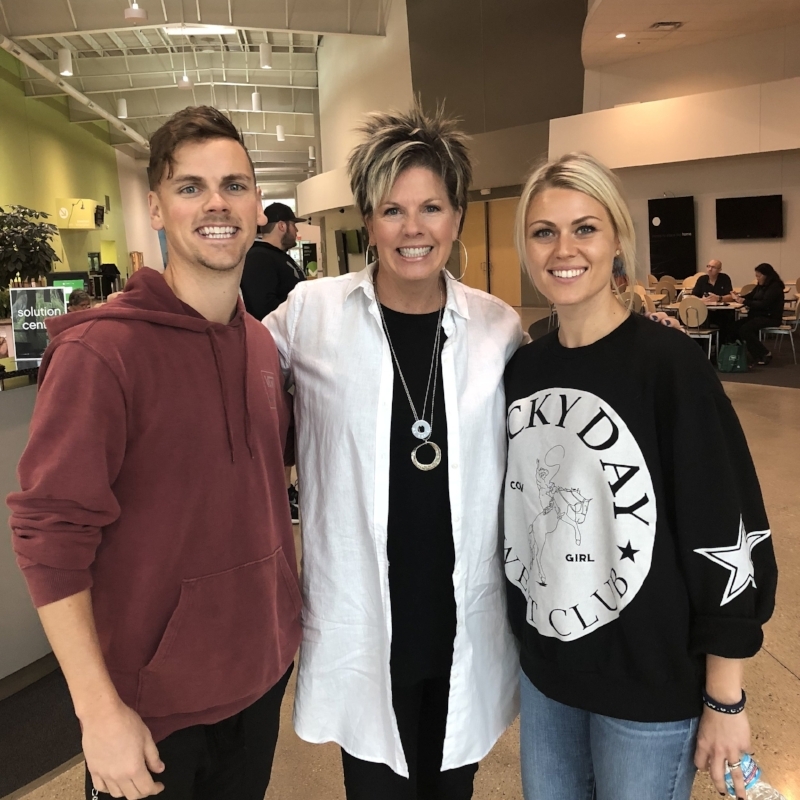 Seriously people -- I cannot tell you how awesome it was to have the Elevation Worship Team here in Kalamazoo, Michigan at Valley Family Church -- for their first stop on the “There Is A Cloud” tour!! We got the privilege of worshipping the Lord with them and I also got the very distinct honor of hosting a podcast with worship leaders Chris Brown and Jane Williams! You guys, these singers are the real deal -- they love the Lord, they love the Church, they love their spouses and kiddos -- and an top of all that they’re totally down-to-earth and fun! So be sure to check out the brand new podcast today, where you’ll hear me chat with Chris and Jane about what it’s like to be on such a well-known worship team and tour the country, as well as hearing their helpful tips on how to juggle family, ministry, etc well -- all at the same time. We also have a great discussion about discovering God’s purpose in our lives...so don’t miss this new episode of The Basics With Beth podcast! There’s something in here that will encourage you, give you that nugget of wisdom you’ve just been waiting for, and maybe even make you laugh! You can find the podcast on iTunes or listen directly on our website!